Welcome to the next installment of our Modern Rolex, Future Classic series—where we seek to highlight watches we think will become collectible vintage pieces in a few decades time. Today, we will be delving into one of Rolex’s most beloved sports watches, the stainless steel Submariner. The Rolex Submariner ref. 116610 features a 40 mm Oyster case in 904L stainless steel and it is waterproof to 300 meters. Helping with the watch’s water depth rating is the Triplock screw-down winding crown. Its unidirectional bezel includes a Cerachrom bezel insert—Rolex’s patented ceramic alloy that is resistant to scratching, fading, and corrosion. The dial of the Submariner 116610 includes large lume-filled hour markers and large luminous Mercedes style hands—all using Rolex’s Chromalight material, which glows blue in the dark. As a Submariner Date model, the ref. 116610 includes a date window at 3 o’clock, accompanied by the ever-present Cyclops magnification lens protruding from the sapphire crystal shielding the dial. The Oyster bracelet of the Submariner ref. 116610 is also fashioned from 904L stainless steel and comes with the practical Glidelock clasp (released in 2008 on the then-new Deepsea and the new gold Submariners), which allows for 2 mm adjustments for a comfortable band fit. Working away beneath the solid screw-down case to power the Submariner ref. 116610 is the ultra-dependable Rolex Caliber 3135 automatic movement. In-house built, COSC chronometer-certified, and offering a power reserve of 48 hours, the Cal. 3135 has been Rolex’s go-to movement since 1988. Why Will The Modern Rolex Submariner 116610 Be A Future Classic? As some of you may be aware, the Rolex Submariner ref. 116610 is so popular—whether in green or in black—in today’s market that it is basically impossible to walk into an authorized dealer and find one available for sale. But how will it stand up in the vintage watch market in three decades from now? We speculate that the Rolex Submariner ref. 116610 will do very well and will, in fact, become a future classic. Why, you ask? Because the Rolex Submariner ref. 116610 brought about a whole host of “firsts” to the stainless steel Submariner model. For instance, the 116610 is the first steel Submariner to have the modern Cerachrom ceramic bezel after 57 years of aluminum bezel inserts. It is especially striking in the bright green shade of the Submariner 116610LV. Furthermore, it is the first steel Submariner to sport the so-called “super case,” which is broader and chunkier than its predecessors (although still officially categorized as a 40 mm watch). In the same vein, it is also the first steel Rolex Submariner to boast the “maxi dial” with larger indexes and broader hands for a modern refresh of the familiar Submariner face. What’s more, this is the first steel Submariner to use blue Chromalight for luminescence, replacing green SuperLuminova. Speaking of stainless steel, the Submariner 116610 is the first Sub to be crafted entirely in 904L steel (case and bracelet) rather than the industry-standard 316L steel. Plus, Rolex’s current steel Submariner is also fitted with a sturdier Oyster bracelet with solid center links, solid endlinks, and the Glidelock clasp—another first in the history of steel Submariners. Essentially, the Submariner ref. 116610 is Rolex’s modern approach to the brand’s classic six-decade-old dive watch. And we are estimating that many of these contemporary details will continue to appear on future Submariner references. 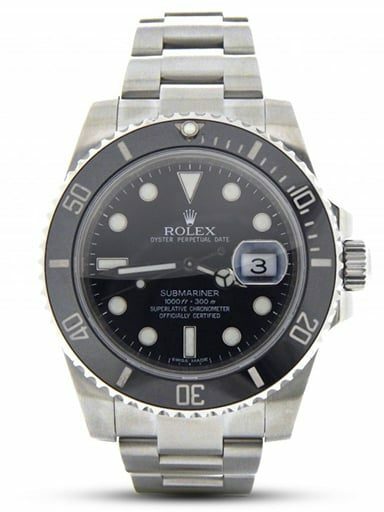 However, there is something about owning the reference that was the first to introduce so many innovations and that is why it is likely that the Submariner ref. 116610 will be a future classic. Another thing to keep in mind is that there is wide speculation that Rolex will introduce new generation Submariner models at Baselworld 2019 to follow in the footsteps of the new-gen GMT-Master II watches released last year. If that is the case, then the production of the Submariner ref. 116610 may be nearing its end. In short, the Submariner ref. 116610 features a slew of modern design traits, it is already hard to find new in boutiques due to its popularity, and its production may stop soon to make way for another reference. The combination of all these significant factors increases the likelihood that this particular Rolex will be a future collectible classic.